Published in the Journal of Media Practice – January 2014. This is my doctoral thesis. The films Not Reconciled and The Border Crossing made as part of the thesis are also available for download. Published in the Journal of Media Practice – July 2008 . 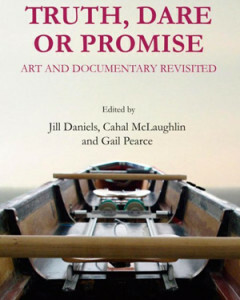 My co-edited book Truth, Dare or Promise: Art and Documentary Revisited (2013) is published by Cambridge Scholars. The book came out of the eponymous conference held at Goldsmiths University of London in 2012. The book reflects on the ways that both artists and filmmakers address the innovations and limitations of producing and exhibiting their work. Ranging from community collaboration to individual interpretation, and from gallery installation to cinematic screening, this book explores the differences and overlaps between definitions and methodologies. With an international reach, including contributors who are both practitioners and theorists, this book maps out developments in art and documentary, covering themes that include explorations of personal experience and to representations of the past, while examining interactive galleries and the cinematic space. I also have an article called ‘The Border Crossing:Experiments in the Cinematic Representation of Memory’. The article refers to the strategies I used in making The Border Crossing (2011), my autobiographical film set in the Basque country which explores memory and trauma. Dahlonega residents will have a chance to see their town through the eyes of film maker Jill Daniels when the Dahlonega International Film Festival returns to town. Of people whose roots go back further than most of the merchants on the square, going back not only their lifetime, but the lifetime of generations. Daniels first discovered Dahlonega when the British-born film maker showed her short film “Killing Time” at the 2001 DIFF. Daniels has a fascination with small towns, having spent the past five years making a film about three young British girls from two different small towns. She found Dahlonega “curious” she said. “It felt like being on a movie set. I think it’s difficult for small towns to know why they exist today.” Daniels stayed at the Smith House during the festival and there she found another side to Dahlonega that gave here the idea for ‘Fool’s Gold. She met Myra and Thomas Crooms, who took care of housekeeping duties while she was there. “Ordinary people are a bit marooned unless they are able to have something to do with the tourists,” Daniels said “(Myra) told me people think of them as rednecks and never interested in what we have to say”. Daniels’ intention was to explore that division in ‘Fool’s Gold’ but the film evolved…Myra told Daniels about her Cherokee heritage, Dahlonega’s history as the first gold rush in the country, and the eventual removal of the Cherokee people…she told of the tragedies of her life, and how she can find solace in the north Georgia mountains she loves. Fool’s Gold premiered at the Downstream Film Fest in Gainesville, winning the Audience Choice Award. It was also one of 10 films to receive a jury award at the Athens, Ohio International Film & Video Festival this past spring. Jill Daniels film “Fool’s Gold” a 60 minute documentary feature about Dahlonega, won the Audience Award at the Downstream Film Fest in Gainesville. Daniels became interested in Dahlonega when she came here to show her short film “Killing Time” at last year’s Dahlonega International Film Festival. Some of the people who appeared in the film went to Gainesville for the screening – Mel Hawkins and Katy Woody were there. But Crooms, who features prominently in the film, did not want to attend. A Border Television documentary…tells the story of four young Cumbrian women whose lives have been transformed through music. The four had learning difficulties and desperate problems which had kept them locked in their own worlds…in ‘Secret Heart’ the young women tell of the influence music has had on their lives and of the inspiration they have drawn from the leading American composer, Philip Glass. A Review of Next Year in Lerin by Beck Woodrow, 2000. On March 15th, we were privileged to enjoy the first showing of Jill Daniel’s film, “Next Year in Lerin”, which tells the story of twenty-eight thousand Greek and Slavic Macedonian children who were taken from Greece by the Democratic Army, without their mothers, to escape the Greek civil war. They were dispersed throughout Eastern Europe; only those of Greek origin were allowed to return. The film centres on a reunion in Skopje to mark the 50th anniversary of the 1948 exodus, where the former child-refugees speak of their journey, of their feelings of identity and longings to at least see the villages they come from. There is singing and dancing, people have come from America, Australia and other places and meet long lost relatives. Intercut with this is archive film of the childrens’ journey and family photographs, and film made in the Greek villages, showing empty houses. One man has been able to return by altering his passport, and he shows a photograph of his family house and a stone he has brought from its foundations. In a moving sequence, hands reach out to touch the rounded speckled granite stone; one man who has not been able to return says, “I think that he is full and I am empty”. At the end of the film, we see a bus waiting at the Greek border, and hear that some were allowed in to visit their old homes and some turned away. (extract) Next Year in Lerin… deals with the shadow of war…presenting the audience with a tragic and largely forgotten bit of war history. During the Greek Civil War that followed World War II, a group of ethnic-Macedonian and Greek children were taken away from their parents and sent to live in a Romanian orphanage. When the war ended, the Greek government allowed only the ethnic-Greek children to return. Unable to go back to their villages, the ethnic-Macedonian children were forced to take up residence in other countries. Meanwhile, their villages in Greece were gradually abandoned…Next Year In Lerin documents the 50th reunion of the children expelled from Greece. In interviews with the director, these now gray-haired “children” describe the difficulties and homesickness they experienced in exile. Even now, with the Greek Civil War a distant memory, these ethnic-Macedonian Greeks only dream of returning home. As a tour bus, bearing a number of the expatriates back to Greece reaches the Greek border in the final scene (some of the ex-pats had finally secured visas), I was suddenly reminded of Theo Angelopoulus’ films Voyage to Cythera and Ulysses’ Gaze.